So, after a crazy long weekend helping out Craft Queen at the Papercraft's Show, where I also got to meet many of my FB friends for the first time, I needed some recovery time! But now, I am back into the swing of things and have a page to share. 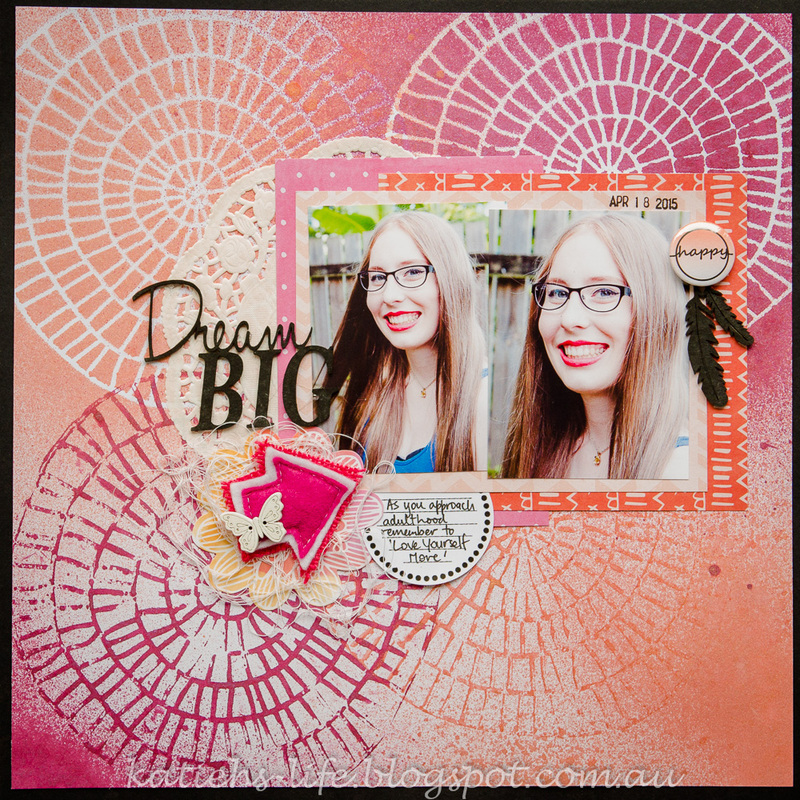 I decided to try my hand at the current Scrap the Girls challenge which this month is a gorgeous mood board. 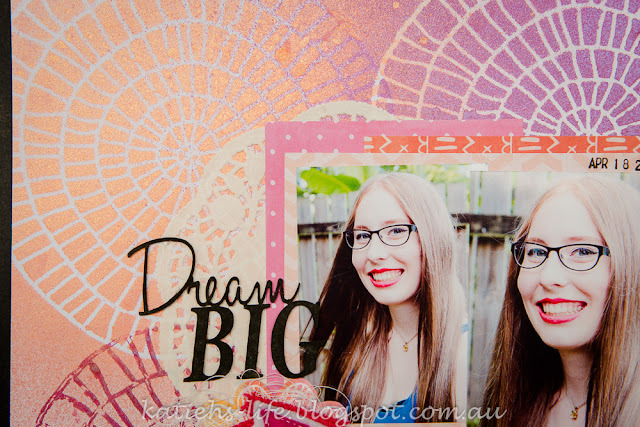 I used my new Scrap FX stencil both as a stencil and a stamp to create my background with some beautiful HS Colour Shine (Raspberry and Peach). A little bit of patterned paper layering to mat the photos and the page was almost done! 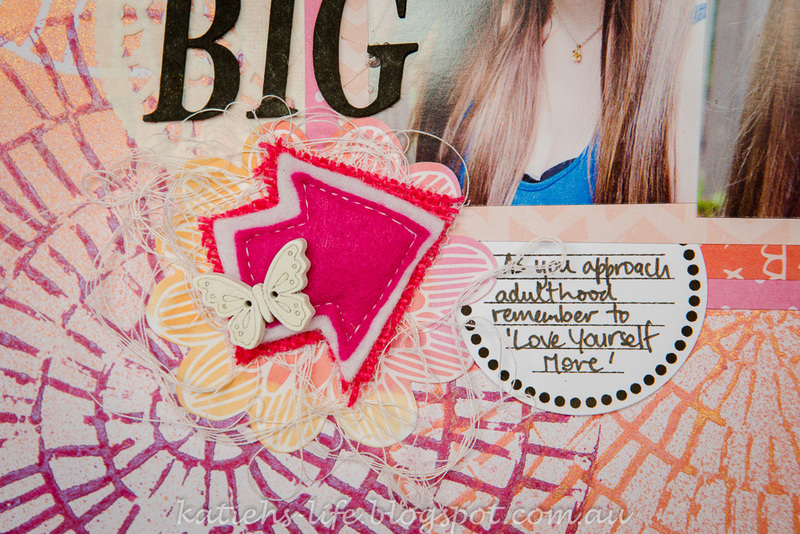 Charms Creations is a sponsor of Scrap the Girls this month, so of course I had to add in one from my collection and this hot pink mini arrow was perfect, topped with a little white butterfly button from D-lish Scraps. I layered these on a die cut flower from an Amy Tan collection that seemed to be the perfect colours and also fit in with the cushion in the mood board. 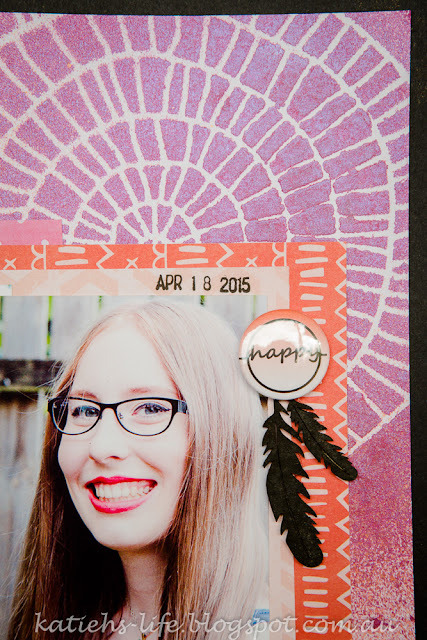 Splashes of black really add some drama to a page like this, so I painted some chipboard feathers (from a just add paper kit from D-lish Scraps) and added them under a flair button. The feathers also feature on the mood board! Another bit of painted chipboard for the title (also from the same kit) and my page was completed! So, there you go, a challenge for June done and dusted. I am hoping to get another one done if I can! Totally stunning and beautiful as always Katie. Wow what a beautiful layout, the stencilling on the background looks so amazing - love it. Thanks for joining us at Scrap The Girls. wow, amazing page! I love how you have reversed the stencil as well! Thanks for joining us at Scrap The Girls. good luck!